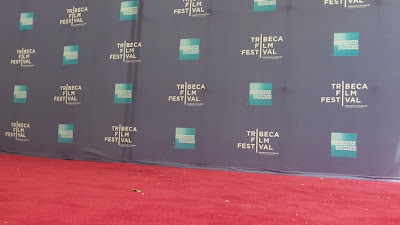 The press screenings are finished which means that for me, the Tribeca Film Festival for 2013 is done. I am so burnt that unless something suddenly appears I'm going to be staying home doing laundry and watching movies in the press library and maybe on pay per view (several titles are available). I also have a ton of stuff to finish up regarding our coverage- hell we have multiple reviews going until next Friday. My final theatrical total is 62 features plus 3 shorts collections. The total is going to rise with my dipping into the on-line press library. I had a blast. I always do. I'll be talking about the experience over the weekend. Today I saw two features and a shorts collection. HERBLOCK- THE BLACK AND THE WHITE is one of the best films of the festival. This is a marvelous look at Herb Block's decades long career as a political cartoonist. Jon Stewart, Lewis Black, Ted Koppel, Tom Brokaw, Carl Bernstein Bob Woodward and others explain why political cartoonists are important and why Block was one of the all time best. What I love about the film is not only is it a portrait of Block, but it also is a wonderful look at the times he, and we, lived in. A masterpiece. Between the two films I saw my third shorts collection CHARACTER WITNESS which is a collection of short biographies. RECOLLECTION is one of the best films of any length at Tribeca. The film is a look at the importance of pictures in the aftermath of the Japanese Tsunami. Looking at several people who are trying to reconnect survivors with photos lost in the disaster the film explains why we need pictures. Its a touching heart felt film that had tears running down my cheeks. GRAVE GOODS is an odd little film about the filmmaker's relationship with her deceased grandmother and her stuff- esopecially her stuff. WHEN THE SONG DIES mixes beautiful shots of Scotland with stories of times past, songs and ghosts as told by old residents of a seaside town. WILT CHAMBERLAIN BORSCHT BELT BELL HOP tells the story of Chamberlain's time acting as bell hop in the Catskills. Its a wonderful tribute to the man and his second family. LAPSE: CONFESSIONS OF A SLOT MACHINE JUNKIE is a home movie masquerading as something more. RIDER AND THE STORM is about a steel worker who lost everything in Sandy and is given a new surf board. Its not bad. And that's it for the daily reports of the festival- however multiple reviews continue to next Friday.